It’s a rite of passage for many North American kids: being sent to summer camp. In the late 70s, early 80s, a spate of summer camp movies came out, usually with some maniac hell-bent on murdering counselors. However in Meatballs, we venture into uncharted territory on the Really Awful Movies Podcast, as this is our first “raunchy teen comedy.” No body count. Both of us attended summer camp, with decidedly mixed results. It twas the best of times, it twas the worst of times, as we variously had a blast, or were socially shunned. It’s an experience many kids face. And who’s there to ease the transition, living on your own in the middle of the bush? Acne-addled camp counselors usually too preoccupied with, shall we say, other teen pursuits to properly care for the campers. In Meatballs, there are rival camps – literally. We’ve got Mohawk, we’ve got North Star. And Tripper (played by Bill Murray), has a quip for all occasions. 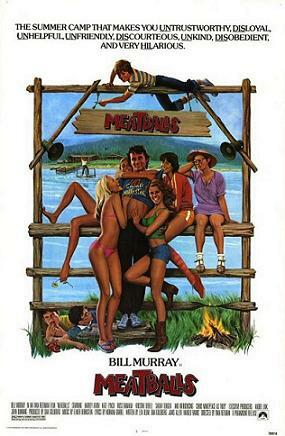 He is an aging camp counselor who befriends young social outcast Rudy, against a backdrop of the usual camp hi-jinks, the pantsing, the crappy mess hall beans, the inane athletic competitions, and of course, the awkward social dynamic between the boys and the girls. This one was directed by Ivan Reitman, the Canadian legend best-known for Ghostbusters, Dave, and Twins (and to horror fans, for Cannibal Girls). Does this film hold up this many years later? Take a gander at Bill Murray’s film debut, and get a sense of the mega-star he’d later become. And join us every week on the Really Awful Movies Podcast, for fun, sharp, genre film discussions.